From catching up on the news before you recharge after a long day, to adding always valuable storage space to your bedroom, this cottage style media chest has it all. 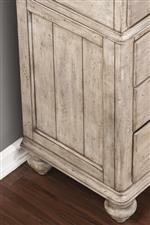 A gorgeous distressed graywash finish provides the storage piece with ample personality and a relaxed vintage look. The hardware shows of an aged bronze look while the tabletop is finished in a medium brown to provide a subtle complement to the piece. 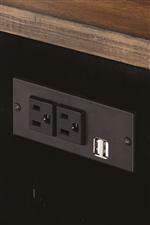 A pair of open media compartments allow for easy placement of multiple media devices while wire grommets in the rear make it easy to keep cords out of sight. 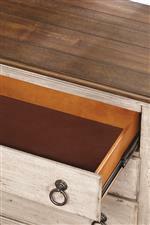 Three spacious drawers provide indispensable storage to your bedroom with the top drawer showing off a felt-lined bottom and the bottom drawer featuring a cedar-lining. The Plymouth Cottage Media Chest with Cable-Accessible Media Compartments by Flexsteel Wynwood Collection at Olinde's Furniture in the Baton Rouge and Lafayette, Louisiana area. Product availability may vary. Contact us for the most current availability on this product. Storage Two open media compartments with wire grommets at the rear. 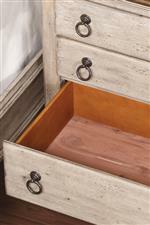 Three storage drawers with a felt-lined top drawer and a cedar-lined bottom drawer. The Plymouth collection is a great option if you are looking for Rustic Relaxed Vintage Cottage furniture in the Baton Rouge and Lafayette, Louisiana area. Browse other items in the Plymouth collection from Olinde's Furniture in the Baton Rouge and Lafayette, Louisiana area.